Emergency Notification Application Profiles: Emergency Notification System - Office Of Emergency Preparedness - 911Broadcast Emergency Notification Articles for Emergency Alerts and Community Warnings. The following article relates to emergency broadcasting systems, specifically Emergency Notification System - Office Of Emergency Preparedness. 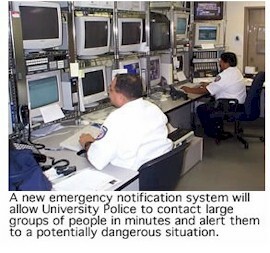 The UTSA Office of Emergency Preparedness recently added an automatic emergency notification system that can call large groups of people at the same time in case of a university emergency. The "Notifier" system has the ability to make more than 1,000 phone calls within less than 15 minutes. "This emergency system will enable the Office of Emergency Preparedness to better inform members of the Tri-Campus community whenever there is a potentially dangerous situation," said George Powers, chief of UTSA police. "The system can even tell us whether or not the call was received." The Notifier emergency notification system also has the capability to deliver an interactive message where the call recipient provides feedback to confirm receiving the call. This emergency broadcasting system can also be used to complete a wide range of tasks including contacting emergency response teams during an emergency or providing scheduled informational calls to the university community on issues such as emergency preparedness and procedures. Further, As part of ongoing emergency preparedness training, the Notifier emergency notification system will be tested in various scenarios across the Tri-Campus community.